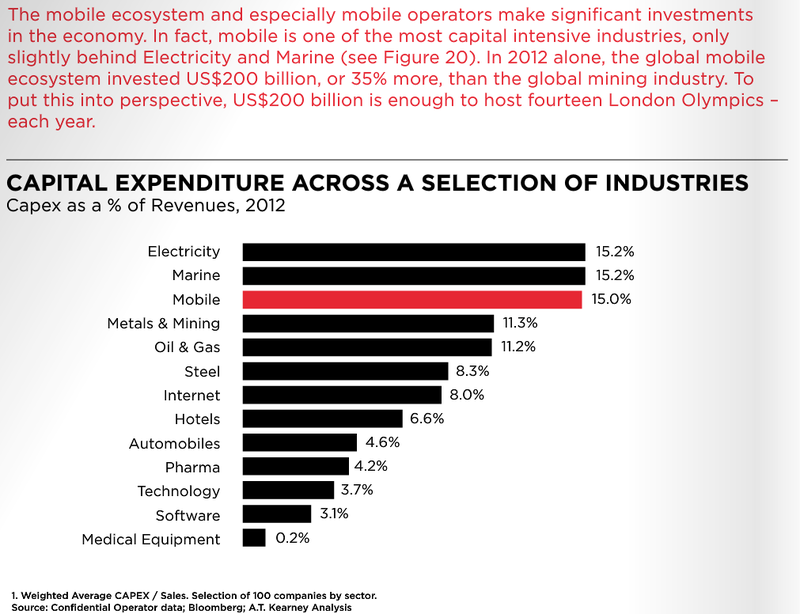 No organization is in a better position than the GSMA to get data on mobiles globally. After all, they’re the global association for almost all of the world’s mobile operators. When they release a report, it’s worth looking at. This time they’ve done a great job of putting some of their research and statistics into visuals, check the full report on “The Mobile Economy 2013” website. 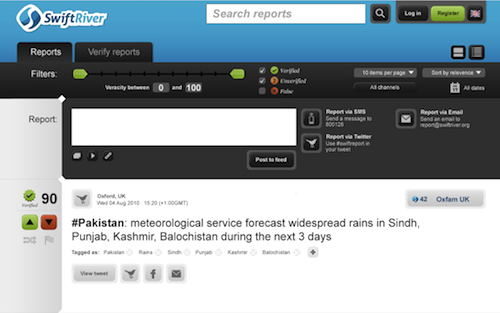 It’s a virtual treasure trove of valuable global and regional mobile information. Data is what is driving the growth to the tune of 1,577 Petabytes of data, with the biggest driver being video. 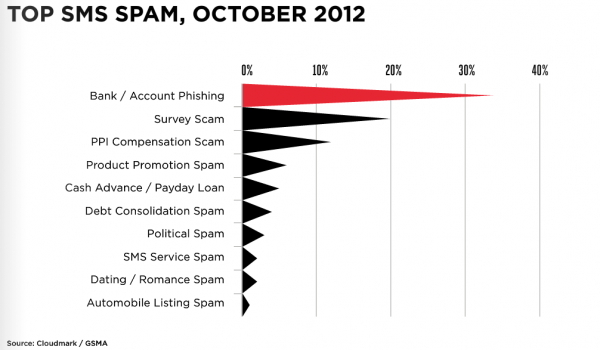 SMS usage is growing, but slowing in growth to 28%. This is thought to be from VOIP and social networking apps. 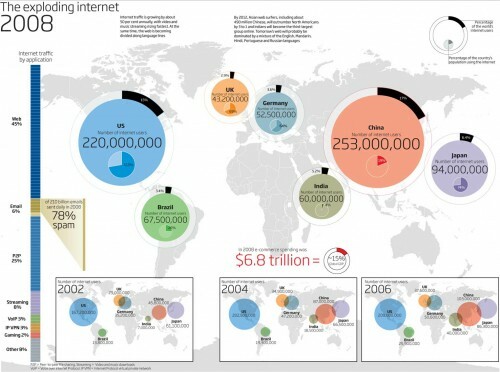 Average revenue per user has dropped form $30.3/month in 2008 to $25.9 in 2012 – this is a big deal in Africa. 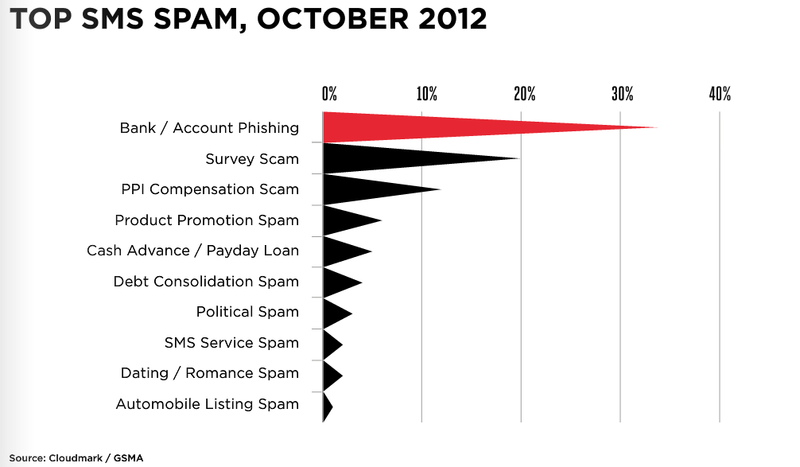 The mobile industry, if you go by this GSMA report, are all about personal security and privacy. We know this is a load of crap, but we can all pretend that the mobile operators really are acting in our own best interests… They are a long way from their mantra of, “an industry supporting and protecting citizens”. Something has changed over the last decade. New technology is lowering barriers. For everyone, and everything. It is disruptive just by existing and by it’s penetration into every corner of the world. We’re talking mobile phones, social media, open data, inexpensive mapping and of course the internet itself. It can be used just as easily for good as for bad, like any other tool and medium before it. However, the biggest difference in our new technology space, is that what before had at least some gatekeepers, now has few or none. Inefficiencies in older industries or organizations are areas ripe to be disintermediated in our day of new tools and democratizing of information. Think big media, government, the humanitarian field and even the medical and healthcare industries. Many of these are centralized, top-down information systems which are being forced (or will be forced) to change, or become obsolete and die out in their current form. Not because what they represent is bad, but because how they do it is no longer viable. Legacy systems and processes were built for a use case that is often decades, if not centuries, old. Internet and mobile phone technology bring new efficiencies and lower barriers. At the very least we can expect new technology to augment what’s there, if it doesn’t displace it entirely. We’ve see this rippling through the media world for the past few years, large magazines and newspapers are going out of print, major TV networks are struggling. New technology is changing the news paradigm. We see it in government, from fund raising to how wars are fought, and especially to how a faster moving populace interacts with a slower, archaic and sometimes rotten system that rules them. New technology makes a nimble adversary out of the people that the government is sworn to serve. We see this in the humanitarian space, where large, slow and ungainly organizations can’t seem to coordinate the resources to meet their mandate, yet raise enough money to keep themselves in business. New technology allows the affected people to self-organize and solve their own problems, and leads us to question why some organizations exist at all. Let me give you a finite example of this, from my own organization, Ushahidi. Ushahidi was born out of the post-election violence in 2008. In that first week, a number of us came together as an ad hoc group of volunteers and in 3 days created a website that allowed anyone in the country to send in text messages, emails or web reports on problems happening in their area and we mapped them and put them on a timeline. It was simple, rudimentary even, but it worked. It worked because people were looking for an outlet, they wanted to let people know what was happening to them. What we’ve seen since that time is that Ushahidi has proliferated, not because of the technology, but because of the use cases that it makes possible. It is a free and open source platform for gathering and visualizing information and it has been used for everything from disaster response to election monitoring, citizen journalism and community engagement. There are now over 20,000 deployments of the Ushahidi platform operating in 132 countries. Our goals for Ushahidi are simple; to disrupt the way information flows in the world by providing the best tools for democratizing information with the least barriers to entry. In the beginning this meant take what took us 3 days to build and make it available to others so they didn’t have to start from scratch. Something that would take them only 3 hours to deploy. Last year we dropped that to 3 minutes with the launch of Crowdmap, our cloud-based version of Ushahidi. We’ve also created many mobile tools, from an Android-based SMS gateway to customizable iPhone and Android apps. We didn’t have the credentials. None of us were humanitarians, we just cared about our home and wanted to do something. We had no funding. It wasn’t until 4 months later that we formed Ushahidi as an organization, and 4 months after that when we received funding. That didn’t stop us from doing something. All of the lessons that we’ve learned through our journey are baked into our organizations culture. We question assumptions and we treasure disruption. We’re willing to take risks that leave us open to failure, in our effort to change the way information flows in the world. The most innovative ideas come from this white space; internally within organizations, in the startup space and in society in general. At the end of the day, much of the white space definition looks a lot like where I live and work in Africa. And I think it’s why its sometimes easier to come up with innovative solutions there, and why we’re going to see an increasing number of solutions to the problems in the West coming from places that look a lot like Africa. The best disruptive ideas come from the edge. So, let’s look at the edge, cases from around the globe, for some examples of how technology is being used to make an impact on violence prevention. Those are all exciting examples, showing what can be done with new technology. Suddenly there are no barriers to entry, anyone can take part, and it doesn’t require that someone have authority to begin. It’s just a matter of figuring out what you want to do and galvanizing a community to take part. Is technology a panacea? Not at all. 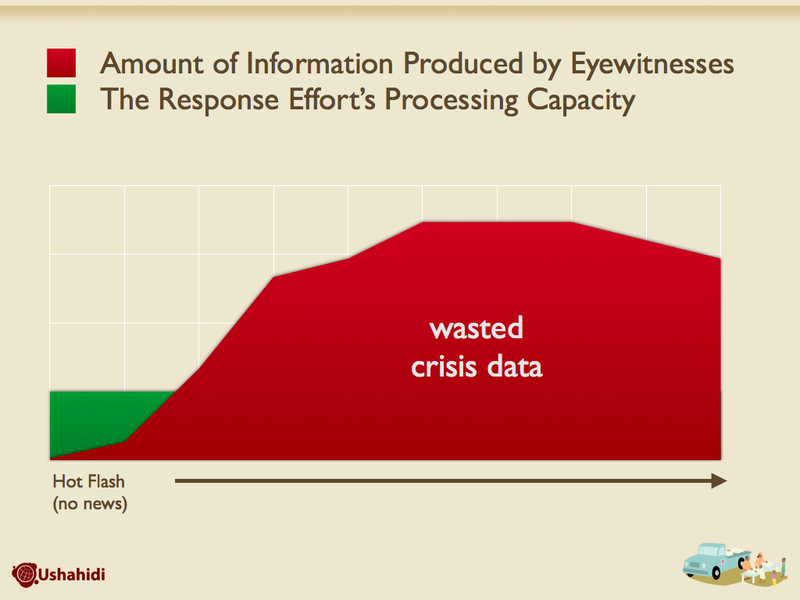 We use a graphic in Ushahidi to remind users of our tools that the technology is only a small part of any solution. We say that 90% of the work is non-tech related, and can take the form of organizing, outreach, branding, translation, etc. It’s a reminder to us as well, that we need to focus on creating tools that augment human activity and get out of the way as much as possible. That, in the end, is what makes the earlier examples so interesting; they worked because they used the simple tools available in people’s pockets to interact and bring attention to a much larger population, audience or intermediary. Just this week a new site was launched, like it’s predecessor in Egypt it’s purpose is to draw attention to the harassment that women get, this time in Ramallah, Palestine. Residents of Ramallah, as well as staff from Palestinian women’s organizations and civil society came together and did something, they built Streetwatch. It was self-organized, it emerged from local needs and tools were found that could suit them. Those 5 words. That simple statement. The revolution is here, you’ve watched it shake industries, rock countries and effect your own community – and what you’re seeing is only the beginning of the massive changes sweeping across the world. It’s not complicated. It’s the effect of technology democratizing information and changing the way it flows in the world. It’s simple solutions, by unqualified but driven people, like the communities in Ramallah, Egypt, India and even here in the US, that provide a foundation for the changes that we’re seeing. It’s ordinary people, using simple technology to organize themselves and take care of their own problems. Your task is to look closely, to understand the basics and then figure out how to use these new tools at your disposal to make a difference. In your case, to specifically prevent violence and help those who have been hurt. 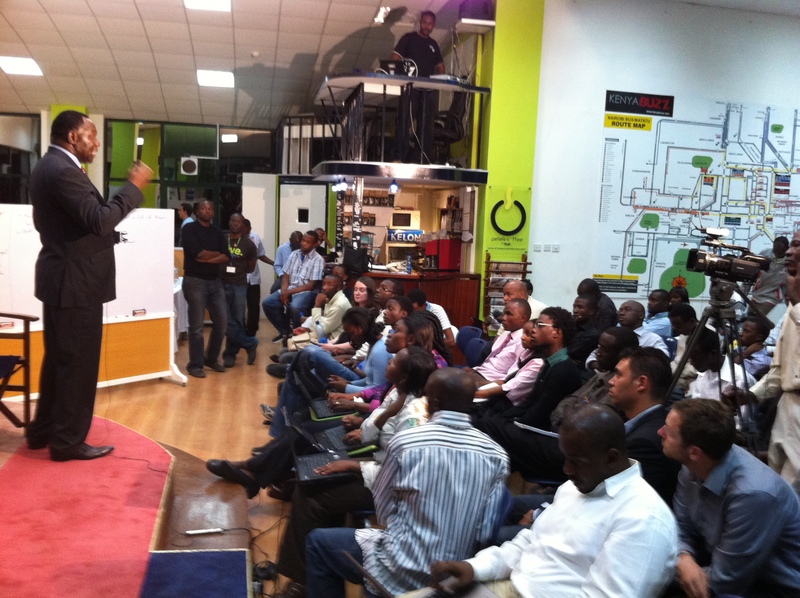 Today Kenya becomes the first country in Africa to launch a national open data initiative. There have been many people pushing for this, over many months, and it’s been an exciting process to watch unfold. Foremost amongst the drivers on this has been Dr. Bitange Ndemo, the Permanent Secretary of Information and Communications. This is indeed a very proud moment for Kenya, and a leading position to take on the continent. The Kenya Open Data Initiative (KODI) goes live this morning in a big event that includes President Kibaki, as well as many politicians, government officials and local technologists. The World Bank, who has been instrumental in organizing and helping publish the data is here as well, along with Google, Ushahidi, the iHub community and a large selection of youth. 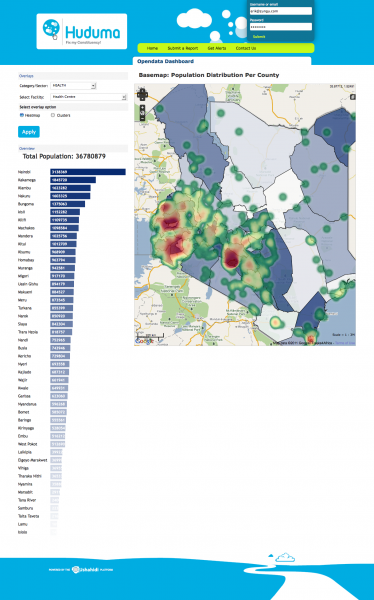 The data is available online through the Socrata platform, which allows users to view different data at national, county and constituency levels. 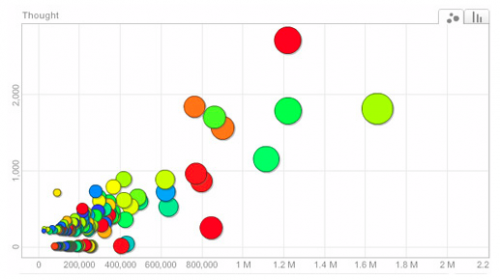 They can compare different data sets, create maps and other visualizations. Data sets are categorized into 6 main categories: Education, Energy, Health, Population, Poverty and Water & Sanitation. 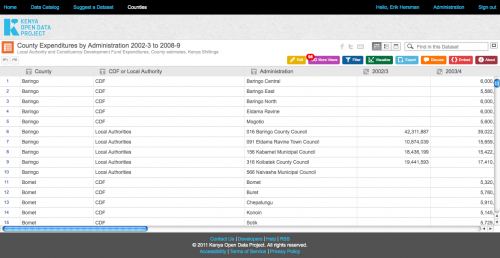 It includes data from the national census, the ministry of education, ministry of health, CDF projects and many more. This all came together rather quickly, starting about 3 weeks ago. The tech community was immediately reached out to, and as the data sets have come online over the last week, we’ve had access to them early in order to show what can be done. Here’s a few samples of that. The Ushahidi team is taking the census data and overlaying healthcare institution data on top of it into our Huduma site. It’s still very beta, but it shows what can be done in just a few days. 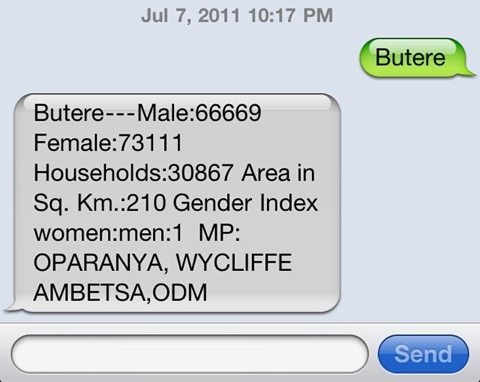 We’ve also built a simple SMS query tool. If you’re in Kenya, send an SMS to 3018 with the name of your county or constituency and you’ll get back an SMS with the demographics and MP of that location. The Virtual Kenya team has built an app that shows which MPs refuse to pay taxes. 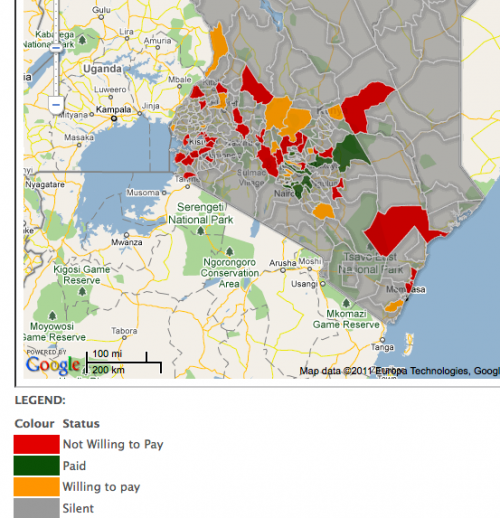 The iHub community has done some things around tracking CDF fund usage in the constituencies. 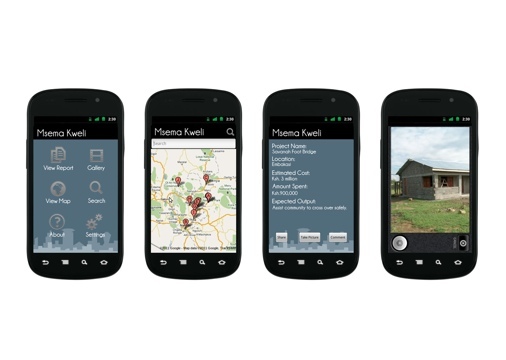 There’s a mobile app called “Msema Kweli” that allows you to find CDF projects near you, and for you to add pictures of them. A scotoma is a blind spot in your vision. Everyone has it, and it’s due to the lack of photoreceptors where your optic nerve exits your eyeball. Normally, it’s right at the center of your vision. 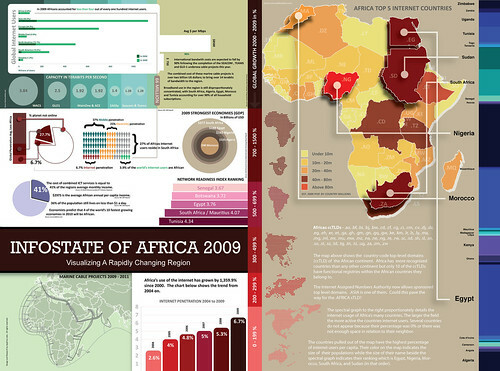 It’s curious to note that most maps have Africa placed squarely in the center, and most are blind to it as well. I’m a big fan of infographics, visualization tools that help us understand something faster than reading a long-winded explanation or a spreadsheet of data. It’s disappointed to see how Africa is usually missing from the global ones – especially in relation to technology. I call this “Africa blindness”. Here’s another great technology infographic, this time by XKCD where he’s showing the IPv4 space (that’s how you get an IP address). Note the glaringly obvious fact that the entire continent of Africa has the same-sized IP allocation as the likes of Apple and half as much as Japan. Is there a case for Africa Blindness in tech? A part of me can understand how a graphic designer sitting in the US or Europe, tasked with creating a graphic, would bypass Africa. After all, if you’re not from the continent, you surely don’t think of it as having much relevance in the high-tech world. 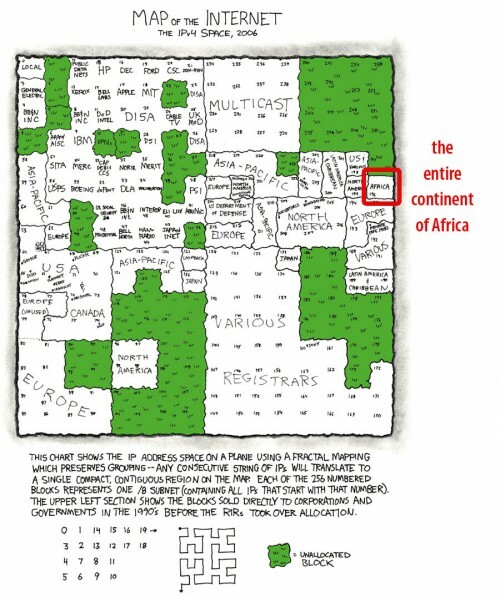 On top of that, it’s not always easy to find web and mobile data in Africa as it is in the rest of the world. The first is an issue of education and media focus. The second is far more serious of a problem. I was fortunate enough to be at TED this year as a Fellow. While there, I did a short TED University talk on the roots of Ushahidi, where it’s going and a new initiative called Swift River. Needless to say, it was only 4 minutes, so I couldn’t get all the information that I wanted to in there. If you would like to know more about Swift, take a look at this video where Chris and Kaushal talk about it in more detail. Currently we’re seeing this at work in India, where a group of people have come together to deploy Ushahidi and Swift River to gather information from normal people about the elections.